Page East, a second-year McWhorter School of Pharmacy student, is Samford University’s 2017 Student Employee of the Year. East, who serves as a senior resident assistant in Beeson Woods, was honored at a ceremony April 13. 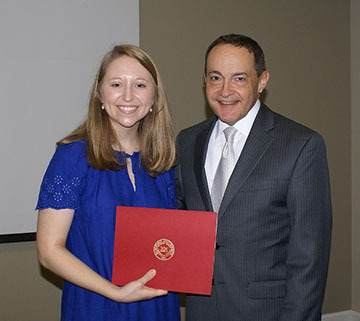 She received a cash award presented by Samford President Andrew Westmoreland. East is one of nine senior resident assistants (SRAs) in the Office of Residence Life and serves alongside 15 RAs in Beeson Woods. SRAs “serve as a resource for RAs through mentoring, supporting and guiding their efforts to build a strong living-learning community in each residence hall” in addition to other administrative duties. East’s nominator for the award, Beeson Woods Residence Life Coordinator Rebekah DeBoer, applauded East’s work ethic, reliability, intentionality and constant encouragement amongst her coworkers and supervisors. Westmoreland stressed the value of events such as this. “I think we all recognize that this is an important ceremony for us every year. It’s important for the students and their families, but also those who work in offices across the campus,” he said. Seven other student employees were recognized for their contributions in areas across campus: Aimee Dykes, University Advancement Office and Alumni Programs; Aly Hilton, Human Development and Family Life Education Department; Carter Jackson, Student Leadership and Involvement; Julia Jackson, Career Development Center; Abby Senn, Academy of the Arts; Jessica Chappell Veazey, Office of Financial Aid; and Thomas Whatley, Printing Services.